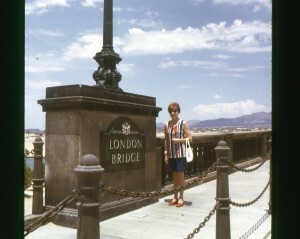 Proof that money can buy anything, London Bridge was moved from the River Thames to Lake Havasu City, Arizona. This picture dates from Jun 1972. This bridge was built in 1831, but was sold by the City of London in 1962. The bridge was no longer capable of supporting modern traffic, and had to be replaced with something sturdier. After a bit of convincing, the Chairman of McCulloch Oil Corporation, Robert McCulloch, purchased the bridge to serve as a tourist attraction for his retirement real estate development. The Town was called Lake Havasu City and served it’s purpose well. After it was disassembled, moved and reassembled here, the new tourist attraction started bringing in prospective clients and land started selling. An “English Village” was built near the bridge and would have been around during the time of this picture. It’s reported that it’s fallen into disrepair and has been partially demolished.